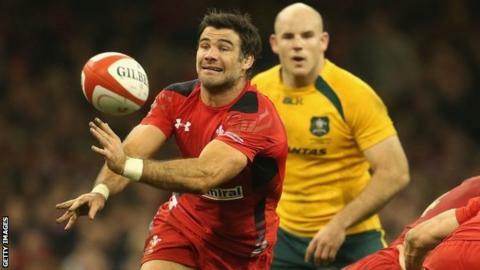 Wales scrum-half Mike Phillips says his club future will be settled on Sunday. The 78-times Wales capped British and Irish Lion told BBC Radio Cymru he hopes to play for his new team in European competition next weekend. "I'm going somewhere tomorrow. I don't want to say anything yet, but I'm away somewhere tomorrow and I'm happy enough," said Phillips. "[I'm] hoping to play next Saturday." Heineken Cup and second-tier Amlin Challenge Cup third-round ties take place from 5-8 December. French reports have claimed the Paris-based club Racing had offered him a short-term contract until the end of the season, prompting the club's denial. "The club denies any meeting and signing a contract with the player," read the statement on their website on 27 November. "It is obvious that, given the very good relations between the presidents, Mr Lorenzetti and Mr Afflelou, no transfer between the two clubs could be done without prior discussion." Phillips joined Bayonne from Ospreys in 2011 and was under contract with the French Top 14 club until June 2014. He appeared before the Bayonne board to answer allegations he turned up to a video analysis session under the influence of alcohol. Two fellow players, New Zealand back row Dwayne Haare and fly-half Stephen Brett, also had to answer allegations at that meeting and were fined but not suspended. Phillips responded by announcing he would take legal action against Bayonne in October. He was suspended by Bayonne in 2012 for off-field misconduct and by Wales in July 2011 after a confrontation with a doorman in Cardiff city centre. If Phillips ends up at Racing Metro the 31-year-old will join fellow Wales and Lions players centre Jamie Roberts and flanker Dan Lydiate at Racing Metro. Both joined the club in the summer of 2013 along with Phillips' 2013 Lions half-back partner, Jonny Sexton of Ireland.